Santa Monica, CA (January 7, 2013) — Here is the chance to discover even more of the blockbuster film when The Twilight Saga: Breaking Dawn – Part 1 Extended Edition, featuring eight minutes of never-before-seen footage, debuts only on Blu-ray Disc (plus Digital Copy and UV), DVD (plus Digital Copy and UV) and Digital Download on Saturday March 2nd from Summit Entertainment, a LIONSGATE company. Now with eight minutes of new and extended scenes added back into the film by Director Bill Condon, along with his optional audio commentary, fans can delve deeper into the epic series they adore. 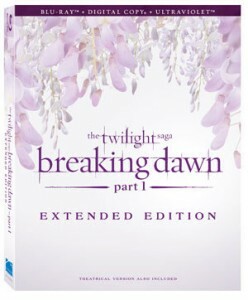 Experience the timeless romance and drama in a whole new way when The Twilight Saga: Breaking Dawn – Part 1 Extended Edition, featuring the original theatrical version and the all-new extended edition with optional audio commentary from the director, arrives on Blu-ray Disc and DVD for the suggested retail price of $29.99 and $22.98, respectively. The Twilight Saga has held its spot as the top-selling home entertainment franchise since 2008 and The Twilight Saga: Breaking Dawn – Part 1 took in $281.3 million in domestic box office sales after its release on November 18, 2011. The worldwide phenomenon continues to ignite a huge following of passionate and loyal fans that have driven the success of the Saga from the beginning. 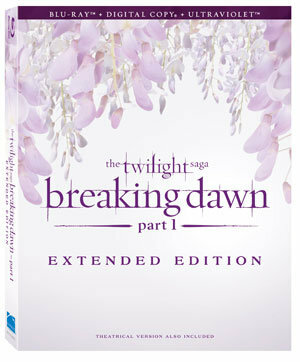 The Twilight Saga: Breaking Dawn – Part 1 Extended Edition now featuring additional footage, presents the marriage, honeymoon and the birth of a child that brings unforeseen and shocking developments for Bella and Edward and those they love, including new complications with werewolf Jacob Black. Lionsgate is a leading global entertainment company with a strong and diversified presence in motion picture production and distribution, television programming and syndication, home entertainment, family entertainment, digital distribution, new channel platforms and international distribution and sales. The Company has built a strong television presence in production of primetime cable and broadcast network series, distribution and syndication of programming and an array of channel assets. Lionsgate currently has 25 shows on 18 networks spanning its primetime production, distribution and syndication businesses, including the multiple Emmy Award-winning Mad Men, the critically acclaimed series Weeds, Nurse Jackie and Boss, the new comedy Anger Management, which has been picked up for another 90 episodes by FX, the network series Nashville, picked up for a full season of 22 episodes by ABC, the syndication successes Tyler Perry’s House of Payne, its spinoff Meet the Browns, The Wendy Williams Show, Are We There Yet? and the upcoming Orange Is The New Black, an original series for Netflix. Its feature film business has been fueled by such recent successes as the blockbuster first installment of The Hunger Games franchise, which grossed nearly $700 million at the worldwide box office, The Twilight Saga Breaking Dawn – Part 2, which achieved the best worldwide opening in Twilight franchise history, The Possession, Sinister, The Expendables 2, Cabin in the Woods, Tyler Perry’s Madea’s Witness Protection and Arbitrage. With the January 2012 acquisition of Summit Entertainment, the Company has now added the blockbuster Twilight Saga, which has grossed more than $2.5 billion at the worldwide box office, to its current slate, giving the Company the two premier young adult franchises in the world. Recent Summit hits include Red, Letters to Juliet, Knowing and the Academy Award-winning Best Picture, The Hurt Locker.